"Using a combination of time-resolved vibrational spectroscopy and Density Functional Theory, we study the vibrational relaxation mechanisms of a metal-adsorbed reduction catalyst." A combination of time-resolved vibrational spectroscopy and density functional theory techniques have been applied to study the vibrational energy relaxation dynamics of the Re(4,4'-dicyano-2,2'-bipyridine)(CO)3Cl (Re(CO)3Cl) catalyst for CO2 to CO conversion bound to gold surfaces. The kinetics of vibrational relaxation exhibits a biexponential decay including an ultrafast initial relaxation and complete recovery of the ground vibrational state. Ab initio molecular dynamics simulations and time-dependent perturbation theory reveal the former to be due to vibrational population exchange between CO stretching modes and the latter to be a combination of intramolecular vibrational relaxation (IVR) and electron-hole pair (EHP) induced energy transfer into the gold substrate. 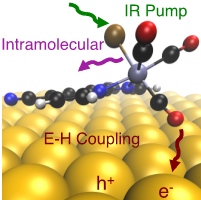 EHP-induced energy transfer from the Re(CO)3Cl adsorbate into the gold surface occurs at the same timescale as IVR of Re(CO)3Cl in aprotic solvents. Therefore, it is expected to be particularly relevant to understanding the reduced catalytic activity of the homogeneous catalyst when anchored on a metal surface.